Human peripheral blood platelets stained with Mouse anti Human Talin antibody, clone TA205 (MCA725G). c-Abl kinase directly associates with talin head domain and regulates β3 integrin ligation concomitantly after PDGF stimulation. (A) Overnight serum-starved A375 cells were either untreated or treated with 20 ng/ml PDGF for the indicated times. Thereafter, the cells were lysed, and the lysates were immunoblotted with indicated antibodies. In inhibition experiments, cells were preincubated with STI571 for 10 min, and the inhibitor remained in the medium throughout the assay period. (B) Serum-starved A375 cells were stimulated as above. The lysates were immunoprecipitated with anti-talin antibody and immunoblotted with indicated antibodies. (C) Serum-starved A375 cells were treated as above. The lysates were incubated with GST or GST fusion proteins, and the bound proteins were separated by SDS-PAGE and immunoblotted with indicated antibodies. (D) GST or GST fusion proteins were incubated with Ni2+ Sepharose coated with His-talin2-head. Bound proteins were separated by SDS-PAGE and immunoblotted with anti-GST antibody. The immunoblotting bands were quantified by densitometry, and data were normalized with respect to the controls. Data are representative of three independent experiments. c-Abl Kinase Is a Regulator of αvβ3 Integrin Mediated Melanoma A375 Cell Migration. Mouse anti Human Talin antibody, clone TA205 recognizes human talin, a ~225 kDa cytoskeletal protein. Mouse anti Human Talin antibody, clone TA205 may be used to stain adhesion plaques in fixed and permeabilized fibroblasts. Mouse anti Human Talin antibody, clone recognizes an epitope between residues 139 and 433. Clone TA205 has also been reported to work in Western blotting. Bolton, S.J. et al. (1997) Monoclonal antibodies recognizing the N- and C-terminal regions of talin disrupt actin stress fibers when microinjected into human fibroblasts. Cell Motil Cytoskeleton. 36 (4): 363-76. Vainionpää, N. et al. (2006) Laminin-10 and Lutheran blood group glycoproteins in adhesion of human endothelial cells. Am J Physiol Cell Physiol. 290: C764-75. Invest Ophthalmol Vis Sci. 44: 3317-25. Calderwood, D.A. et al. 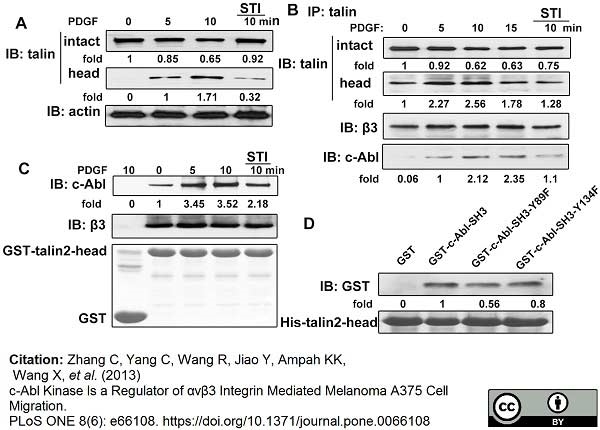 (1999) The Talin head domain binds to integrin beta subunit cytoplasmic tails and regulates integrin activation. J Biol Chem. 274: 28071-4. Cui, L. et al. (2009) c-Abl kinase is required for beta 2 integrin-mediated neutrophil adhesion. Koch, S. et al. (2013) Cathepsin D deficiency induces cytoskeletal changes and affects cell migration pathways in the brain. Hasenson, S. et al. (2005) The immortalized human corneal epithelial cells adhere to laminin-10 by using Lutheran glycoproteins and integrin alpha3beta1. Exp Eye Res. 81 (4): 415-21. Braga, V.M. et al. (1995) Calcium-induced changes in distribution and solubility of cadherins, integrins and their associated cytoplasmic proteins in human keratinocytes. Cell Adhes Commun. 3 (3): 201-15. Valmu, L. et al. (1999) The cytoskeletal association of CD11/CD18 leukocyte integrins in phorbol ester-activated cells correlates with CD18 phosphorylation. Eur J Immunol. 29 (7): 2107-18. Zhang C et al. (2013) c-Abl Kinase Is a Regulator of αvβ3 Integrin Mediated Melanoma A375 Cell Migration. PLoS One. 8 (6): e66108.